Welcome to Part 3 of my Christmas Tree Ornament Posts! 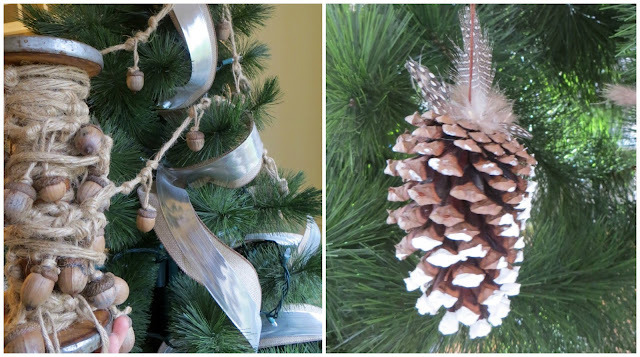 I grouped these ornaments together because they both come from nature! 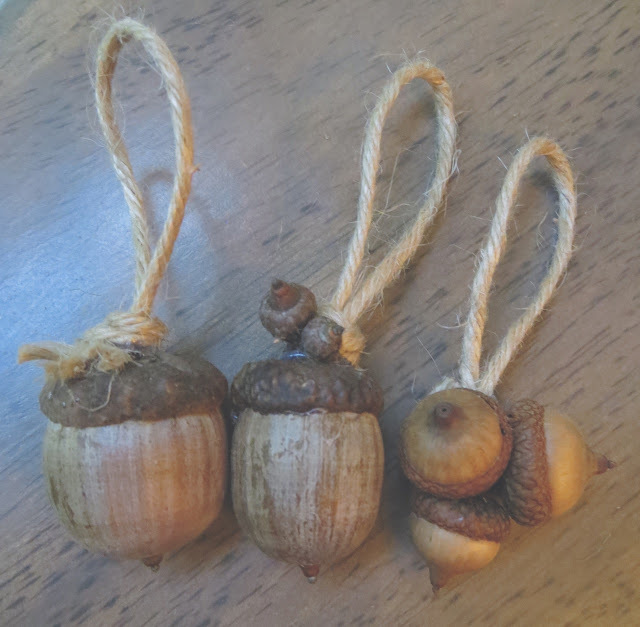 When I first gathered acorns I intended them to be individual hanging ornaments. Unfortunately I didn’t consider the size of my tree branches and I made the loops I glued on top of the acorns too small! I sat them aside and wondered how I could use them. After I made this ‘rope’ garland I thought how it would look nice to have the acorns hanging from it! I love when things work out! If you want to make a garland with your acorns, you may consider tying loops onto your rope first and THEN gluing your acorns to the loops. Mine shift around but that doesn’t bother me enough to untie all the knots on my rope and tie the acorns on individually. 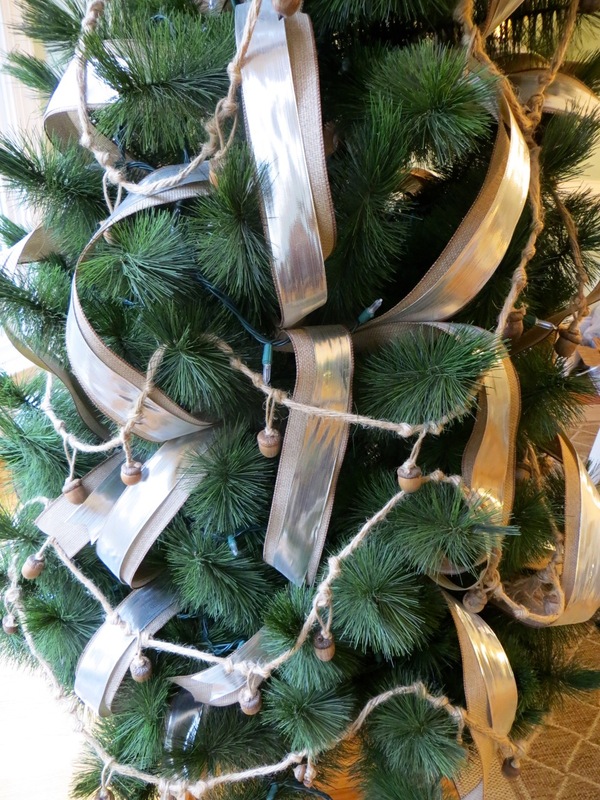 *I didn’t measure my rope but I’m estimating my finished garland (after tying the knots) is about 80-feet long. 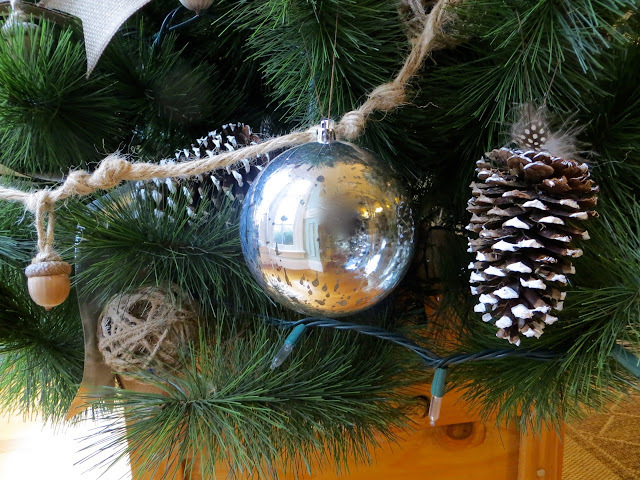 Consider starting with a length of 90-feet for an average-sized tree. 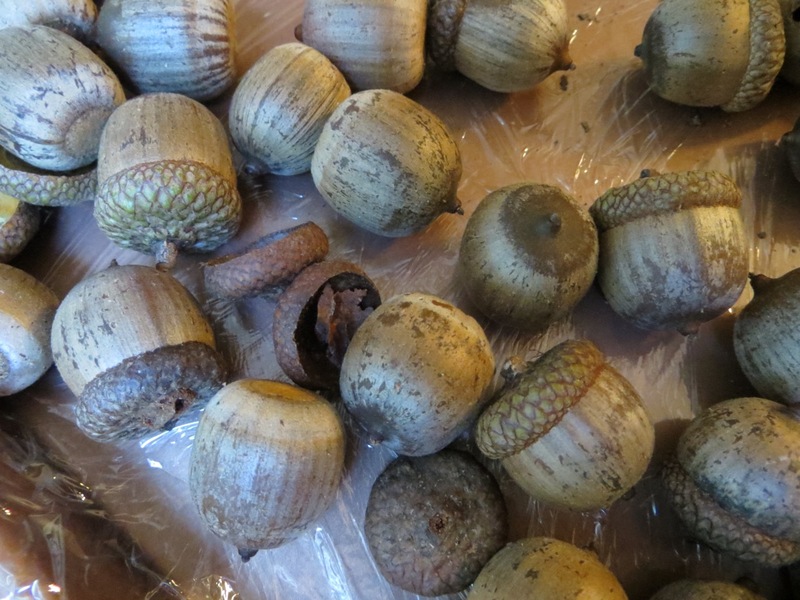 We went for a family walk along the lake and found a bunch of acorns. I was so happy because I knew I wanted some for our tree. It was fun for the kids to try and find the biggest ones and they really thought it was a treasure to find ones with the hats on still or ‘twins’ or ‘triplets’ that were still attached on the stem. PICK YOUR ACORNS WISELY. You want to pick the freshest ones so they’re not soft/rotten. Even if they are fresh you still want to inspect them for any holes. 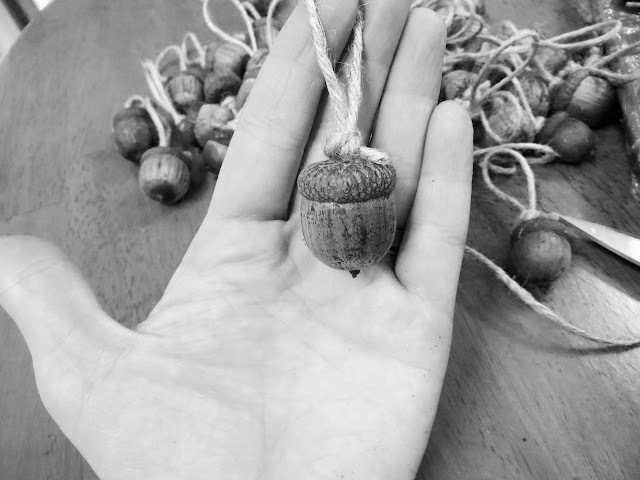 If there are holes in an acorn that means you will probably have a chubby little larvae emerging from them in a few weeks (I know from experience). 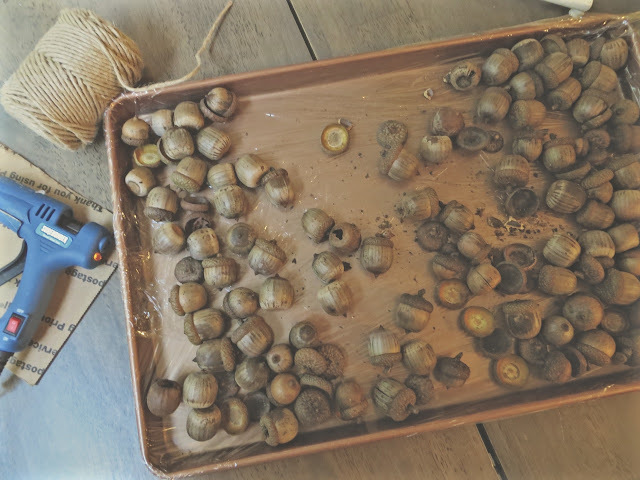 Clean your acorns from dirt and hot glue the tops on with a generous amount of glue. If the tops haven’t fallen off yet, pull them off and glue them back on. Cut twine pieces, match the ends together and tie a knot as close to the end as possible. Put a pea-size amount of hot glue on the center of your acorn hat and press the twine knot until it cools. 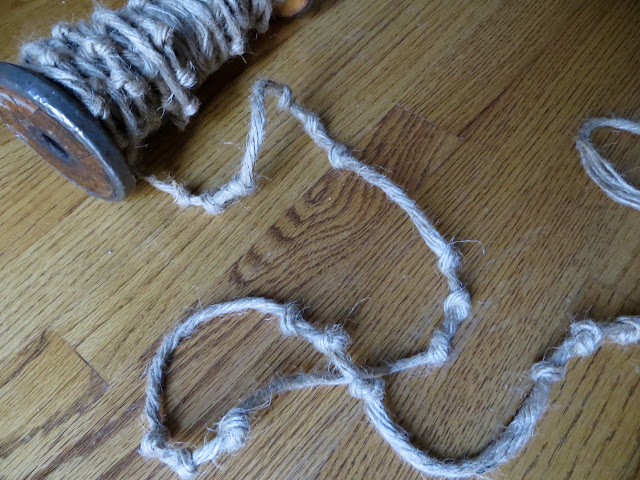 For my jute rope I started in the center and started tying clusters of 3 knots all the way to the ends. I eyeballed everything and it goes pretty fast if you do it mindlessly. 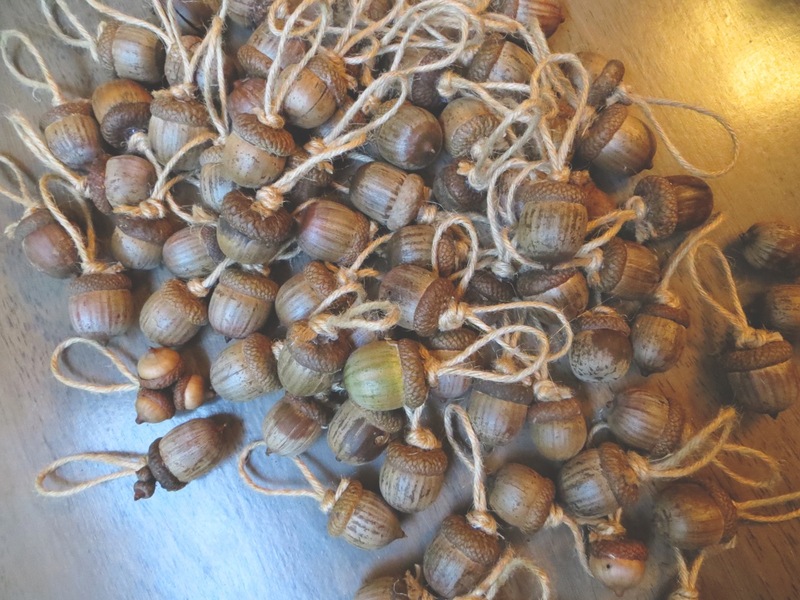 I slipped my acorns on my rope so there was one for every knot cluster. 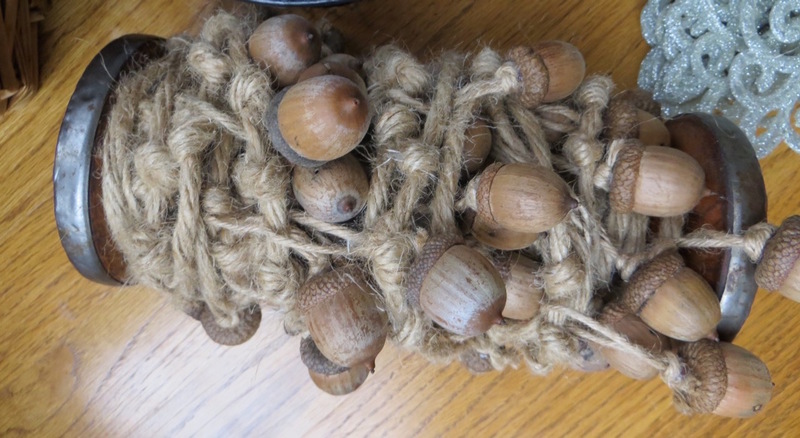 The knots keep the acorns in place while on the tree. 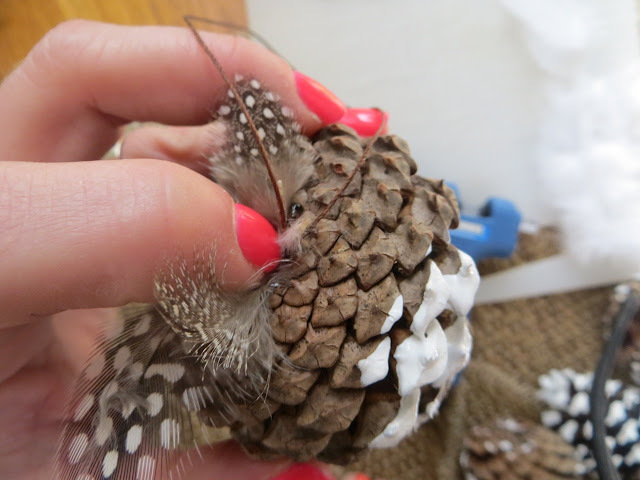 Ensure your pinecones are clean. 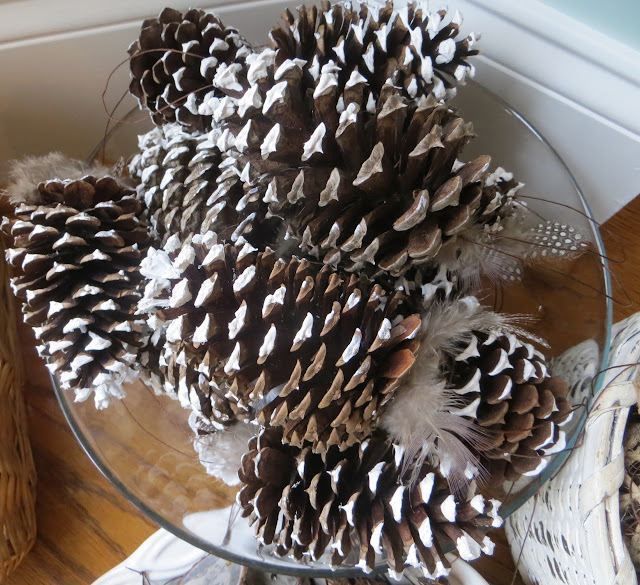 Pour a layer of paint on a disposable plate and roll your pinecones around. 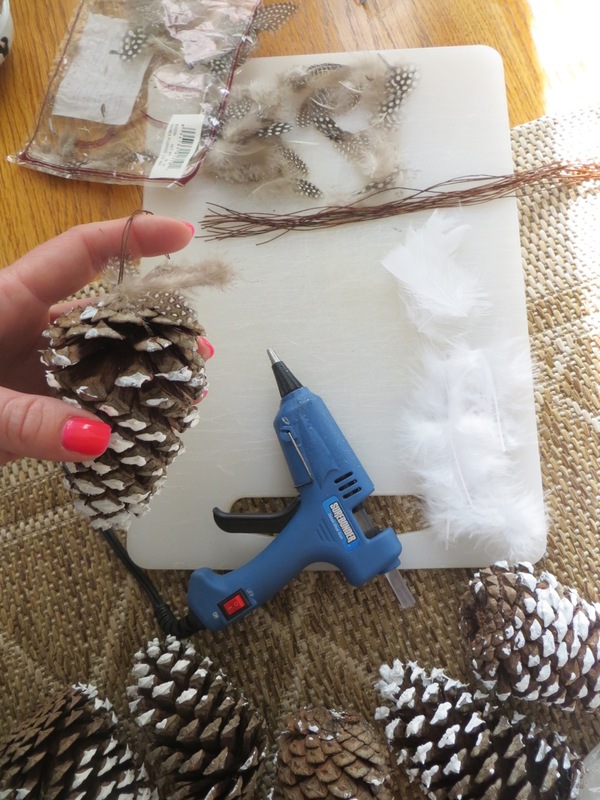 Sprinkle glitter over paint while it is still wet. Let dry for several hours. Cut string so it will make a big enough loop to fit on your tree branches. 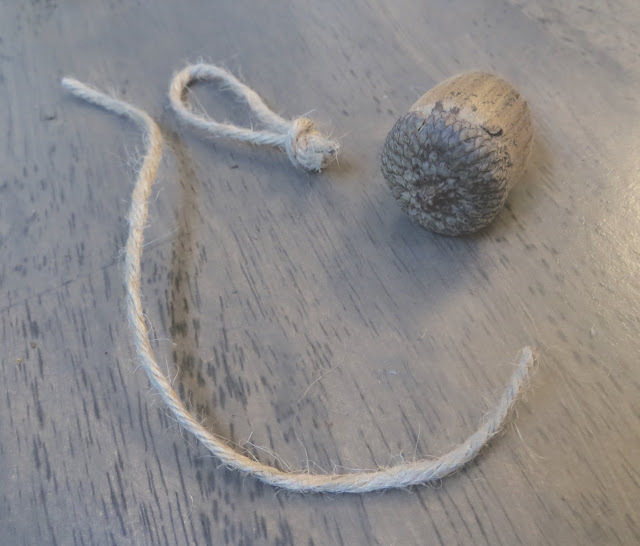 Match ends together and tie a knot. 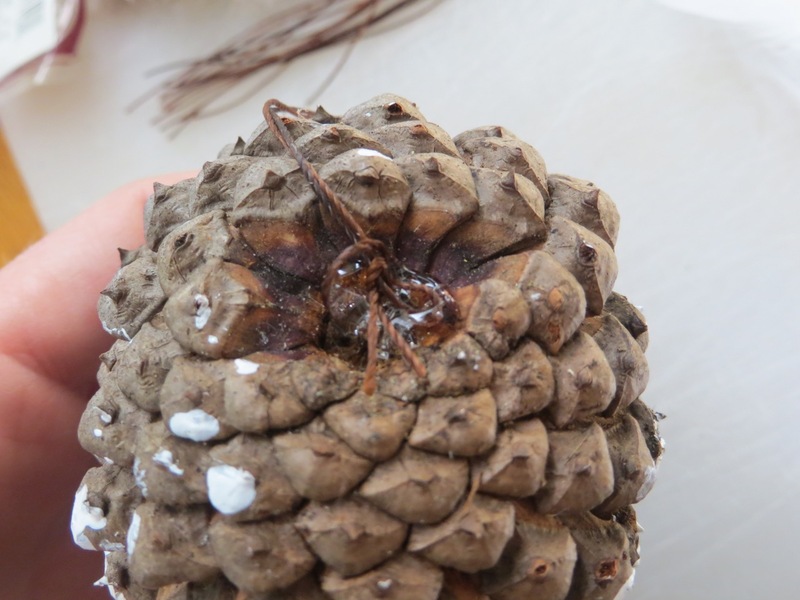 Put a generous amount of glue on the bottom of your pinecone to ensure it will hold well. 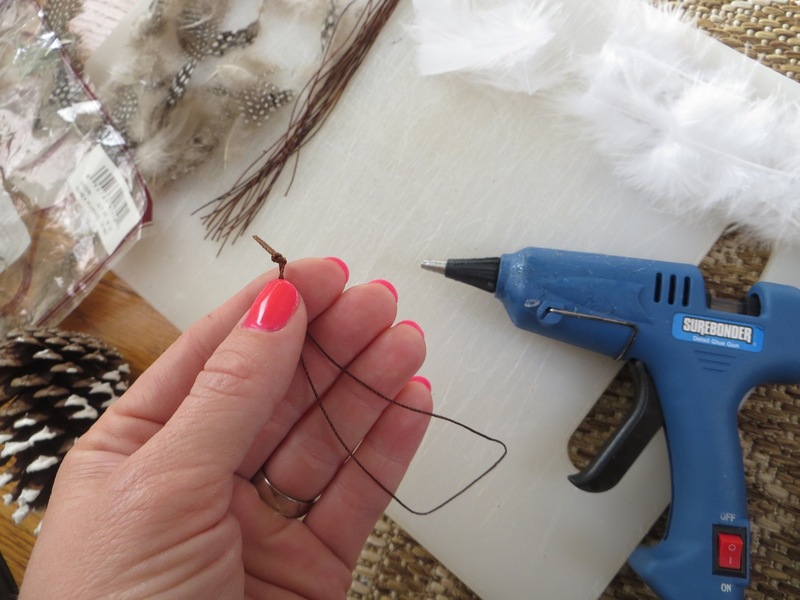 Place feathers over excess glue and use your fingernail to press them in.